by Germanic culture. You can't toss your leopard-print scarf over your shoulder here without hitting a boutique run by Gucci, Armani, Dolce & Gabbana or one of the many major fashion designers based in Milan. But non-fashionistas shouldn't fret; history and architecture are also highlights. Check out attractions like the Santa Maria Nascente, Christendom’s third largest church, appreciated for its daunting façade, grand entrance piazza, the Piazza del Duomo, and striking interior. Like everything else here, don’t expect what you know as Italian food at the dinner table, rather, rice and stews often replace pasta. Hotels like Bulgari Milano are constantly full and as a result, expensive – you’ll find particularly high prices during the annual Furniture Fair in April, but relatively low prices can found in the city center. first in February/March and then in September/October. Check for exact dates before you book your trip, as the flood of fashionistas inevitably drives up prices around the city. 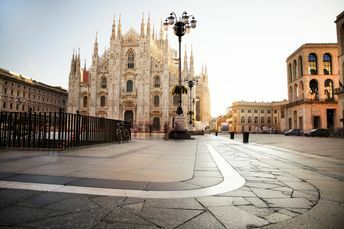 For a great off-season trip, April and May are ideal, when temperatures are in the 60s and 70s (16-25C) and you can enjoy a stroll around Italy’s modern financial capital without feeling like you are being judged for wearing shoes that are so last season. Milan is my hometown, the place where I grow up. Its tourists are mainly business people or someone in transit. But while it does not offer the history and art of Florence or Rome, it has so much excellence to offert that would be a pity to ignore it. Milan is a strange city, a little different from other italian coties. There are few monuments and historical sites. For sure I wouldn't visit it for a cultural trip. However it is very alive, full of great restaurants and clubs, smart people, fantastic shops. During the fashion week and the ' salone del mobile ' it turns in a fantastic place, overcrowded with people, parties. I suggest to visit it during autumn or spring. During summer it is too hot and the city is almost empty. During the weekends people from Milan love going out of the city, so it turns empty. One of the great habits of Milan is aperitivo. So instead of dinner you could choose a club serving apertivo, almost any, and you could have fingerfood with the beverage....instead of dinner. Great and funny. The Gothic cathedral in the very centre, Sant'Ambrogio is fantastic but, apart from it and Scala Theatre, there is not so much to see. Anyway you will enjoy deeply all the rest, including theatres. The area I love, and it is really very nice, is Brera. Gae Aulenti area is also fantastic. A great city for moda and design, but also history and renaissance discovery, many many hiden sites all around the city that will blow your mind !! The contrast between new skyscraper and historical architecture is bluffing ! Oh Milan. You'll work up an appetite whether you're shopping for incredible vintage pieces at Vintage Delirium or staring at The Last Supper at Santa Maria delle Grazie. It may not be a site that you've heard of, but Chiesa di San Maurizio al Monastero Maggiore is simply stunning and was one of my favorite stops in Milan. Don't worry, you'll be able to fuel up on delicious truffles at Tartufotto Milano and sipping delicious cappuccinos at G. Cova & Co. If you're looking for a fun lunch, why not swing by SlowSud Cucine di strada where they have a table in the front room made out of swings? Tiger Via Meravigli is a great spot to hit up if you're looking for quirky gifts for folks back home. Milan is also a great jumping off point for adventures in Alba or Venice. I'll definitely be back. There's a lot to love in Milan! An often overlooked city of Italy, but filled with wonderful culture, design, food and fun. Very crowded and chaotic at first encounter. Happening right now till the end of October , 2015, the World Expo has food and sustainability as its theme . Pavilion at the World Expo.